It is often said that “the camera is a character” in certain movies. Usually this is just sort of a clever way of commenting on the subjective viewpoint of the camera, but in this case the camera (and the titular man who operates it) is literally a character in the film. At all times we are aware of its role in the process, seeing it being toted around, watching over the people, creating editorial juxtapositions and impossible tricks. It’s not ironic or self-conscious, it’s a celebration of what the cinema can bring to life, a dazzling spectacle of the power of movies and its ability to reflect and unite society. It’s also something of a cliché to say “the city is a character” but here it is undeniably so. 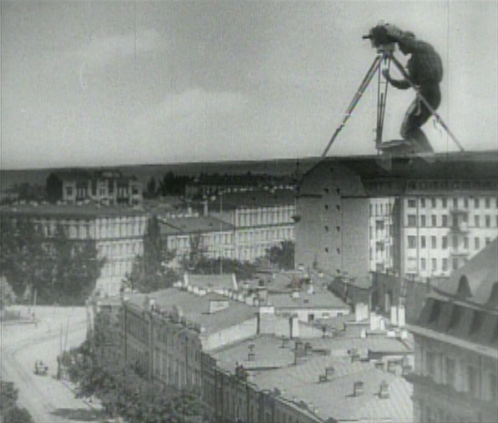 As one of the great “city symphony” films that were fashionable in the late 20’s and early 30’s, it explores Moscow and its inhabitants from every angle, showing a citizenry on the move, working and progressing and enjoying, and incorporating the camera into the fabric of that society. People at sport, on the beach, on the job or dealing with family life, all brought together by the magic of film, with wonderfully inventive camera language and editing technique. This entry was posted on April 24, 2012 at 1:10 pm	and is filed under Movie Reviews. You can follow any responses to this entry through the RSS 2.0 feed. You can leave a response, or trackback from your own site.